Well this photo is totally different. Brings along various feelings -- mostly, fearful. 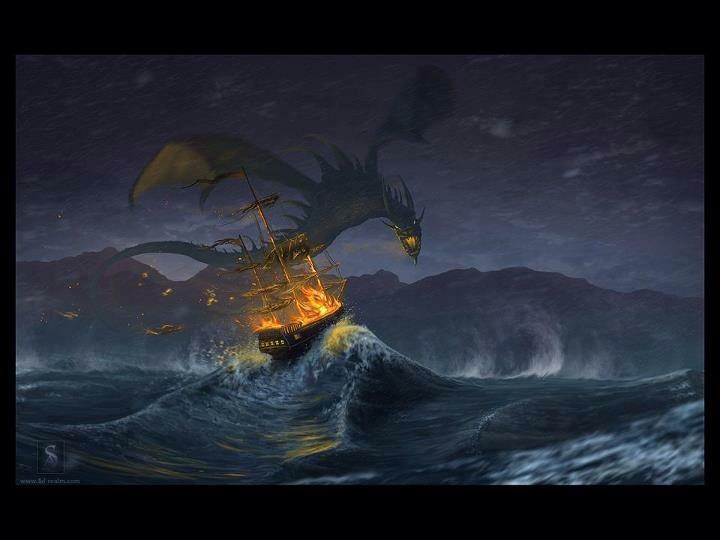 Between that rogue wave, the ship on fire, that dragon type animal, and the eerie and sombre colours -- I know I'd personally be petrified out of mind, "if" I were truly in that predicament. Yes, I'd definitely say, take hold of: "Luke 10:19" !!!!!!!!!! Wow! Kinda feel bad for the ship. I like the dragon! It adds a nice fantasy element to the picture! Wow, what an interesting picture! Thanks for sharing and thanks, I now have both pirate books on my kindle!